Live long and party! Celebrate the 50th anniversary of the most beloved sci-fi series with this stylish magnetic badge. 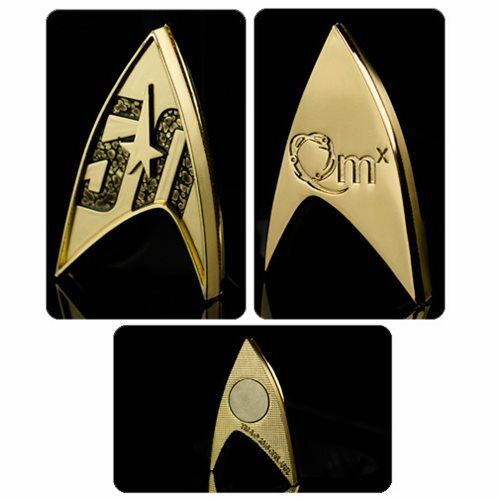 Cast in metal and plated in gold, this badge is debossed with the official Star Trek 50th anniversary logo. Each badge features a magnetic back so that you can proclaim your fandom without ruining your Starfleet uniform. The magnet is strong enough to even sport it on your favorite uniform jacket. Make this anniversary a great one with the stunning, two ounce, highly-detailed collectible pin! Measures 1 1/3-inch wide and 2 1/5-inches tall. Ages 13 and up.